Our organization has established a remarkable presence in global market for offering highly effective Phosphoric Acid. Available in aqueous solution, the Phosphoric Acid is a colorless, odorless and non-volatile liquid. In addition to being a chemical reagent, Phosphoric Acid is used as a rust inhibitor, dispersing agent, food additive, fertilizer feedstock, electrolyte, flux, industrial etchant, dental and orthop(a)edic etchant and component of home cleaning products. Our Phosphoric Acid is widely demanded by the customers owing to its high quality, purity and efficacy. 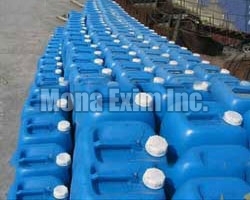 We make available Phosphoric Acid in different quantity packaging at competitive prices.